AMHVet® Active Manuka Honey Vet is our totally natural antibacterial cream containing 25% of 15+ UMF (activity factor) manuka honey suitable for all damaged skin areas. 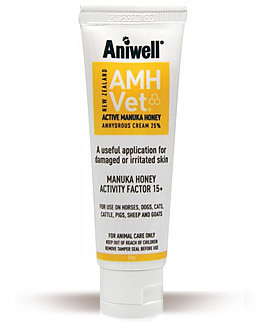 Apply directly onto the area requiring care --> AMHVet Cream will minimize bacterial infection on damaged skin areas. A dressing is not required to hold the cream in place as it does not warm up and run off • the cream forms a waterproof film over the damaged skin. As the wound heals (no infection present, colonization cleared) cover the damaged skin area with FiltaBac Cream to allow the skin to breathe and recover naturally. No need for a dressing with FiltaBac! AMHVet Cream has a skin soluble surfactant added to maximize surface contact. The primary advantage is from the unique Antibacterial effect that is determined by tests formulated by the Waikato Honey Research unit at Waikato University NZ as stated by a plus (+) number. Ideal antibacterial activity is achieved if the Active Manuka Honey is 15+ and above. The Peroxide effect (H2O2)--> this is released from the honey when aqueous (fluid) contact is made (serum production from damaged areas). Honey is a super sugar solution so when applied to damaged skin it draws moisture/fluid from the area (using osmosis) so working as a gentle poultice. AMHVet Cream 25% maintains the 3 benefits as outlined above. The AMHVet Cream has the added advantage that it will adhere, maintaining its form, and cover damaged areas without running off. For skin areas with minor damage, repeated cover applications of AMHVet Cream will protect and soothe the skin. Application of a dressing or covering the area with a dressing may be required. WHAT IS SPECIAL ABOUT ACTIVE MANUKA HONEY?